I just came across this tip and was hesitant at first, but it actually does work! If you are on a budget like me, saving a few dollars is always a plus! The next time you have green onions, don’t throw away the white ends. Simply submerge them in a glass of water and place them in a sunny window. Your onions will begin to grow almost immediately and can be harvested almost indefinitely. 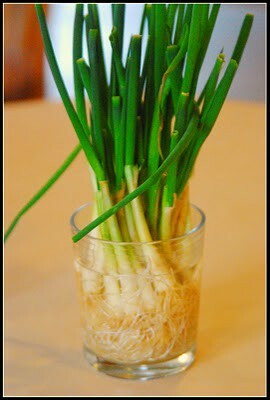 Why buy green onions at the store if you can just grow your own at home! This entry was posted in Uncategorized and tagged budget, food, free, greenonions, kitchen, onions, pinterest, student, tips. Bookmark the permalink. This is awesome! Had no idea… Can’t wait to try this out! I actually took the white bottoms with the roots still attached and planted them in my herb garden. I called it the Stonehenge of Scallions. They were most of last summer until the desert sun (I live in Phoenix) fried everything. Amazingly, I think they’re coming back. Even though its January, I see some skinny ones back there now.